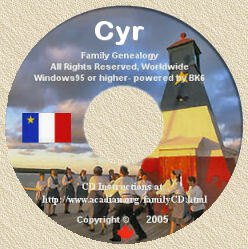 Acadian Genealogy Homepage; Instructions for using the "Specific Family Genealogy" CD-ROM. iii) Read Item #3 of the CDMenu. Use the scroll bar to scroll across, and read all of the important information. iv) Click on the second button to start the Brother's Keeper Program. IMPORTANT: AFTER you have started the B.K. Program, as instructed in its opening window, click "edit" to view the data files. Note: You will know when you have properly accessed a data base file, since the number of names and families will appear at the bottom of the BK opening screen. - Double-click on the "My Computer" icon on the desktop (Windows95 to Windows XP). - In the My Computer window, right-click on the CD ROM symbol in which you have placed the CD-ROM. - Click on "AutoPlay" (at the top of the window). Note: If for any reason, the CD-ROM does not start as noted above, use the following instructions? b) If you have Windows Vista or Windows 7 and you get a message when starting BK that says "the data should not be below the C:\program files folder". then click here. c) If you are using Windows Vista or Windows 7 you MAY need to set the BK6 program to run with administrator rights, depending on the Brother's Keeper Version installed (i.e. prior to Version 6.4.5... If it is an earlier version (than 6.4.5), right click the BK6 icon and pick Properties, Compatibility, Run as administrator, then click OK.
d) If you still encounter difficulties, click on the "HELP" command of BK6, then on "ABOUT BROTHER'S KEEPER" to determine which version has been installed on your computer. If the version is previous to version 6.4.5, connect to the Brother's Keeper web site at http://www.bkwin.org/version6.htm and download the latest version UPGRADE of their program [Version 6.4.5 as of April 2010]... at the bottom of the page... and install it on your computer. This will resolve any Vista and/or Windows7 issues. Final Note: If you have purchased one of my Family Genealogy CDS after April 2010, the latests 6.4.5 version is most likely what installed on your computer. So, be sure to check first (as per above) before you source (or attempt to upgrade) the latest version. The update is "free", unless you decide to register the progam (which is not necessary, but is not a bad idea since you will be provided a printed BK User Manual as part of the registration fee)! a) By default, Vista and Windows7 does not have the RUN function in the START menu. You can access RUN by pressing the "Windows" and "R" keys of your keyboard, SIMULTANEOUSLY. c)Next, click on the OK button to start the CDMenu. 1. Insert the CD in your computer CD-ROM Drive. 2. Click on the Windows "start" button. 3. Click on the Windows "run" button (See note above for Vista and Windows7). 5. The Brother's Keeper will install on your computer and create a "Brother's Keeper 6" icon on your computer desktop. 6. Double-click the newly created BK6 icon to start the program. 7. a) The FIRST TIME you start the program, you will be prompted for the location of the data files, as follows: "Which folder contains the Brother's Keeper data files?" Click on the drop-down [small, black] arrow [pointing down] and then highlight your computer's CD-ROM drive in which you have placed the CD, (usually D: or E: but could be another letter... there will be a very small picture of a disk, on the proper drive letter). DO NOT CHOOSE ONE OF THE FOLDERS LISTED? merely highlight the drive letter and then click the OK button. b) When you start the program thereafter, the data files should automatically appear. IF NOT, then click on FILE, then OPEN DATABASE and when you are prompted for the location of the data files, follow the above-noted instructions to load the database files. 8. The Brother's Keeper program will open within about 15 seconds. To start the reports and charts, pick from the choices under DESCENDANT, ANCESTOR, LISTS and OTHER. [A good place to start to see all the names on the CD, is by clicking on LISTS, then ALPHABETICAL DISPLAY (Last name) which will provide a complete list of names on the CD. Then double-click any name to see the details of same]. You can also use the F3 "Find" key to search for any/all individuals on the CD-ROM. PLEASE NOTE: You do NOT need to register the Brother's Keeper Program, in order to be able to use it! Special Note 2: If you see an error message, such as... "Error during CREATE. d:\BK6\Person.DT6 STAT=94"... it is because you are attempting to use the Brother's Keeper program to view files within a folder, on the CD. DO NOT use the Brother's Keeper Program to view the files inside the numerous folders on the CD-ROM. For example, you should a word processing program to view the historical text files in the DOCUMENT folder. Special Note3: If you choose to transfer the data files to your hard drive (see Detailed Instructions below), you will need to make certain the "file attributes" are _not_ set to "READ ONLY", otherwise BK will not work properly (it won't be able to "read" the data files). To do this, right-click on each data file, choose "properties" and then make certain you TURN OFF the "read Only" attribute... just click on the "READ ONLY" attribute (to remove the check mark) and then pick "Apply". Summary: While the files are on the CD, they will always be "Read Only" (and this is normal). However, when they are transferred to the hard drive, the "Read Only" attribute must be turned off, as previously described. 9. Using the "search" option: After you have clicked on "Edit", you will be taken to the edit screen. While in the edit screen, click on "Find" (or press F3 on your keyboard) and then on "find a person". Type the name or number of the person (if you know it) you are looking for. Or, type ? in place of the first or last name. 10. Brother's Keeper provides excellent reports and charts. The many choices are located under the "Descendants", "Ancestors" and "Lists" tabs, in the Main Menu screen. 11. Also, be sure you hook-up your printer to your computer. Note: I want to immediately stress, that Brother's Keeper is a SHAREWARE program and while permission for its use was granted me by its author, John Steed, to obtain the full benefits of the program (including a complete instruction manual, future updates, additional features of the program and technical support), I encourage you to register the program by visiting BK's web site at http://www.bkwin.com or http://www.bkwin.net or, when in the BK6 program, click on the "help" button and then "How to Register". Follow the instructions outlined there. In my opinion Brother's Keeper is the BEST shareware program available and its minimal cost is well worth it! If you presently use a Genealogy Program to record your data, and that program has "gedcom capabilities" (such as PAF, Family Tree Maker, Legacy etc. ), you may prefer to IMPORT the GEDCOM file (located in the gedcom folder on the CD), directly into your own program. This, of course, eliminates the need for you to learn how to use the Brother's Keeper Program. However, I would caution you to import the gedcom into a NEW FILE, so as not to duplicate individuals in your personal data which would then require the merging of those duplicate names (this can be a very tedious task). Before proceeding, you should carefully review the "help" file of your own genealogy program, for details on importing a gedcom file. Note: If you're using a genealogy program which does NOT have gedcom capabilities, you are using the wrong program (in my opinion)! Just a little information that you may find useful. I have a few of your CDs, which have been very useful. At first I accessed the data using Brothers Keeper as you suggested, but in general I found it awkward and slow to access your records. Having to load the disk each time and open a new program was annoying. As I use a program called Legacy for my family file at home, I found that it was much easier for me to import your data into a Legacy Family file using GEDCOM format. It creates a Legacy family file for each disk with the same formatting and source formats as I already use for my own family file, making it so simple to search records and family lines. I keep your family files permanently loaded on my computer named by family line on your disks and can open them at will without accessing your disk each time. Just click the file name and its open. You may want to mention this to your customers that use Legacy. When I want to update and research info I can open your file and my simultaneously and include info from your files with any source information already there. Its Great!!! Note from Yvon: This applies to _any_ genealogy program which has "gedcon" capabilities! 1. The above-noted Brother's Keeper web sites, contains tons of information on the use of BK6 (currently the latest 2002 version). The version included in this CD-ROM is in English only however, with updates, BK can be used in Norwegian, French (Belgium), German, Danish and Icelandic. Language files will also be available for French (Canadian), Dutch, Dutch (Belgium), Slovenian, Swedish and Afrikaans (foreign files for those language may be available by the time you use this CD). Check the Brother's Keeper web sites at http://www.bkwin.com or http://www.bkwin.net for complete details. 2. BK6.0 requires Windows95 (or higher) to operate. 3. While the Brother's Keeper program installed on the CD is fully operational (except for certain features only available by registration), in the event you want to add, delete or modify information on the database, it will be necessary for you to transfer all the data files (which are on the CD) ending with the extensions .dt6 and .dta located in the D:\ CD-ROM folder, to your own computer hard drive C:\Program Files\Bk6 folder. This is best done by using the "cut-and-paste" method. In some instances, you may also have to transfer a file named bkoption.p6 from the CD to your hard drive. If your CD does _not_ contain this file, then you need not be concerned with it. I do not recommend you attempt to do this, until after you become very familiar with viewing the files directly on the CD-ROM and after you have registered the BK6 program and received the Instruction Manual, provided by Brother's keeper. 4. Now you will be able to add/edit/delete any/all data provided, but most importantly, you will now be able to enter your own personal data to the existing database. 5. When you "browse" the CD-ROM, you will find a number of other folders. DO NOT use the Brother's Keeper Program to access the information in the following folders. For example, use a word processing program to view the historical text files in the DOCUMENT folder. a) ACADIAN BOOKS: Numerous sources of Acadian books (none available from me); [added in 2007]. b) ACADIAN-CAJUN Gifts: Here you will find pertinent information regarding the very unique and personalized gifts/products available at the Acadian-Cajun & French-Canadian Online Boutique, for your own surname. c-2) In 2010, added sub-folder "ACADIAN-FRENCH CANADIAN" music folder, as well as "CAJUN" music folder. d) ACADIAN RECIPES Folder: [Added in 2005]. e) BK INSTRUCTION Folder: Be certain to read the "ReadMeFirst" document for information on using the files contained therein. [Note: This folder is only included on CD's shipped _after_ January 31, 2003]. f) CD INSTRUCTIONS Folder; A copy of this document. g) DOCUMENT Folder: This folder contains a ton of very interesting Acadian-Cajun historical text files which I created using the program MSWord. I encourage you to view each of these files using a word processing program such as Notepad, Wordpad, MSWord, WordPerfect etc. h) FAMILY CRESTS (Coat-of-Arms) Folder: [Added in 2003]. Over the years, I've collected a vast amount of "Family Crests" the graphic files of which, I include in this folder. i) GEDCOM Folder: This folder contains a copy of the actual GEDCOM that was used to create the database on the CD. As you become more and more familiar with the BK program, you will see the benefit of having/using GEDCOM files. j) MAPS OF ACADIA Folder; [Added in 2003]. j-2) In 2010, added folder POWER POINT PRESENTATIONS. k) PROGRAM Folder: This is the folder that contains the bksetupE.exe file (as described, above), used to install BK on your own computer hard drive. l) READ ME Folder: This folder contains a copy of all the information on this page (the file name is familyCD.doc), as well as the Brother's Keeper readme6.doc which I encourage you to read using any word processing program. m) SOFTWARE Folder: Contains over 200 freeware/shareware genealogy utilities/programs, which you may find useful; [Added in 2004]. a) Once on your own computer hard drive, BK6 should start within 10 seconds or so. If however, BK6 starts very slowly, the problem could be a conflict with some other program that is currently running on your computer, such as an anti-virus program. Turn off your anti-virus program temporarily and then restart BK6. If it starts quickly, then change the options in your anti-virus program so it does not slowdown BK6 (i.e. disable the anti-virus program when using BK6). Other programs that may slowdown BK6, are phone answering programs, or a program called Babylon, or programs that monitor the temperature of your motherboard. b) If your mouse cursor disappears when running BK6, then run the mouse Intellipoint program and turn off the option to "Hide" the cursor in some programs. c) A few users of Windows XP have reported that BK6 only works when they are logged-on as "Administrator". John is interested in hearing from anyone who may have encountered this 'problem' and have any suggestions to offer. Please e-mail John at [email protected] or contact him via telephone at: (616)364-5503 or via Fax at (616)866-3345. F1 Help (on all screens). F2 Calculate birth date based on death date. F9 Do not show matching names when adding. CTRL+- Give a child the father's last name. CTRL+F10 Save text as CTRL Key. TAB Go to next field. Shift+TAB Go to previous field. If an unexpected error occurs while the Brother's Keeper program is running, the error screen will be displayed. It will give the error number and a short description of the error. It will also show what part of the program it was in and it may show what button was clicked last. If this happens, you should either print the error screen (with the PRINT button) or write down the error information. Then click the CLOSE button. If you still have an hourglass foe a mouse pointer, go up to a menu and pick FILE and CLOSE, and the screen should close. 2 Input/Output error. File is damaged or could not be created. 3 File not open. If you get a STAT=2 error when opening, then you will get STAT=3 every time you try to read from the file. 4 Key value not found. The record was not found but should be there. 5 Duplicate Key (two people cannot have the same ID number). 12 File not found (A needed data file is missing). 25 Create Input/Output error. Disk full or root folder dull. 30 Not a Btrieve file. Something may have copied over the file. Or, you may be attempting to use BK to read a file on the CD, which requires a program other-than BK. i.e. a .doc file requires MSWord, Wordpad or Notebook to be read. 42 Incomplete accelerated access. If you create a new set of BK data files with the split routine or gedcom import, and if something goes wrong, the new files are damaged and should be erased. 54 Variable page error. Damage to a sector in the file. 58 Compression buffer too short. Run BKSETUP.EXE and it should set the correct compression. 87 Files are already open. Stop Windows and reboot the computer. NOTE: If you wish send an error report to John Steed (the author of the Brother's Keeper Program), please include the date of your program (Pick FILE and then ABOUT). Also include any other helpful information, such as; "the error only occurs if you pick certain options, or it only occurs if a person has multiple spouses, etc." BROTHER'S KEEPER is a Shareware product protected by copyright. It is NOT public domain or free software. Shareware is a method of distributing software, whereby copies may be passed around and each user may determine whether or not the program is suitable for him or her. After you have tested this program for yourself, and if you find it to be useful for you, you are requested to send the registration fee to the author of the program, John Steed. The author of the program is not paid any fee when you buy a disk from a user group or company selling Shareware. The only way the author gets paid is when you register. If you want to encourage programs of this type, please register by sending $45 and the registration form that can be printed from the main screen by picking Help, then How to register. Registered users will be sent the current version and a printed manual and receive technical support, a password to turn on all features, and they are entitled to use the program, and all future upgrades to the program. They will also receive substantial discounts on future versions. The extra features currently include the ability to create RTF (Rich Text Format) reports of the book style reports, to do a Soundex search in Word Search, to print a 6 generation ancestor chart, to print pictures of the children on the Group sheets, to print a single page from the Preview screen, and the ability to print or display a Picture Summary from the Other menu. If you have purchased the registered version of Brother's Keeper, then the bottom of the main screen should say "registered version". If it does not, then pick Help, Enter registration number and type in the numbers that are inside the cover of the Brother's Keeper manual that you received. If you share this program with others, please give them the BKSETUP6.EXE file. If you also want to share your data files, you may pick File, Backup data files. If anyone sells copies of Brother's Keeper or offers Brother's Keeper "free" with the purchase of any other product, they must explain to the buyer that they are getting the shareware version of Brother's Keeper and that there is a $45 fee to be paid to John Steed if they wish to register the product to get the manual and technical support. They may explain that shareware is a "try before you buy" system. Anyone that sells copies of Brother's Keeper and does not notify the buyer in their advertising or on the diskette that it is shareware is violating the copyright. Anyone that advertises Brother's Keeper for sale on a web page must indicate on their web page that Brother's Keeper is shareware. No one may charge more than $10 for copies of Brother's Keeper without permission from John Steed. No one may give or sell their Brother's Keeper password or any valid password to another person. There are a few companies that buy directly from John Steed and sell registered copies of Brother's Keeper. They will provide you with a printed manual (a white and blue paperback book) with the registration number and password inside the cover. Those companies currently include S&N Genealogy Supplies, Testware Publishing, Ancestral Computer Company (Phil Young), Carl Miller, Michael Pahlow, South Australian Genealogy Society, and Appleton Books. When you purchase the program from them, please send John Steed your name and address and registration number and you will be added to the mailing list to be eligible for discounts on updates. The German version of BK is also sold by Walter Kolzer and he does not provide the English printed manual. He will provide you with a registration number and password. If you need to contact John Steed, please include your registration number and address. If anyone else sells you Brother's Keeper and gives you a password, please notify John Steed of the registration number and who sold you the program. They might be a new dealer, but if they are not authorized to be giving out passwords, John would like to know about it. There is no reason for you to give your password to any other person. If someone asks you for your password, please notify John Steed. If you are on the main screen of BK6 and you click the menu item EDIT and nothing happens, then run the FULL install program for BK6 again (not the update). If you get an "ordinal" error while installing, or if you click Edit and get an error number 339 about component LTOCX12N.OCX then click here. Otherwise, if you click File, General To Do Items, what is the error number? If you pick Other, Picture Summary what is the error number? 1. While these CDS are intended to be run on PC platform only, be advised that I include the applicable GEDCOM file on each CD. Thus, if you are using a genealogy program on your Mac computer which has the capability of importing GEDCOM files (i.e. Reunion), you can easily import that file into your own genealogy program and run it on your Mac computer. 2. I'm also told by a "Mac friend" that you can run it using Windows emulation software, such as Virtual PC however, it is somewhat slower running because of emulation mode... but I'm told it WILL work. Final Note: Since all of my CD's are PC-based (and I am NOT a Mac person), I'd be interested to know how well (or even, if) this 'solution 2' works, from any Mac Users.